100% cotton M-Tape conforms and provides firm support to ankles, wrists, and hands. Can also be used on equipment, such as baseball bats or hockey sticks. Polyurethane Foam M-Wrap protects your skin from athletic tape. Also great for holding pads or socks in place, and as a protective wrap while wearing hiking boots, ski boots, and other footwear. 100% cotton M-Tape conforms and provides firm support to ankles, wrists, and hands. Can also be used on equipment, such as baseball bats or hockey sticks. 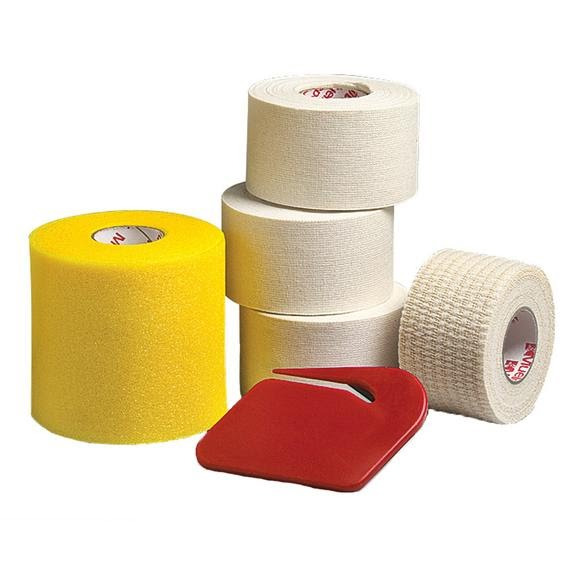 Polyurethane Foam M-Wrap protects your skin from athletic tape. Also great for holding pads or socks in place, and as a protective wrap while wearing hiking boots, ski boots, and other footwear. Tear Tape is a lightweight elastic adhesive tape that requires no clips. It&apos;s great for hard to tape areas like fingers, hands, and wrists. Also used as a compression wrap or fixation bandage for padding and cold packs. Tape Cutter makes tape removal a breeze.